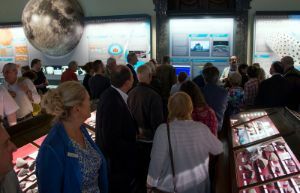 The Natural History Museum of Vienna (NHM Vienna) presented a special Asteroid Day afternoon program with the highlight being the opening of a Meteor-Radar station in the museum’s famous meteorite hall. The event was organized by Dr. Julia Walter-Roszjar; Univ-Prof. Dr. Christian Köberl, Regional Coordinator of Asteroid Day Austria and NHM Vienna CEO and Director General; and Dr. Ludovic Ferrière, NHM Vienna Curator.The event started with a welcome from Dr. Köberl and a lecture to the public from Ing. Michael Zwingl, president of the Austrian Radio League (ÖVSV), about the detection of space debris using radar. 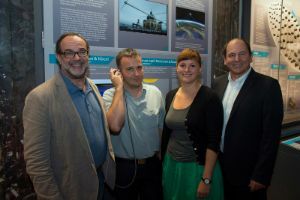 The organizers then officially opened the Meteor-Radar Station. 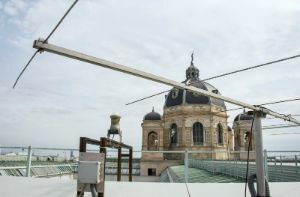 The station shows a signal from a receiver antenna on the roof of the museum, installed in collaboration with the ÖVSV. Museum visitors can now follow the influx of meteors visually and acoustically in real-time, a world premiere in a public museum. NHM Vienna has a livestream of the station going at all times. It is usually full of static, but during meteor showers it comes alive with visuals and sound. You can learn more about the meteor station here.